It should come as no surprise that two of the history making women attorneys in the coastal bend were also founding members of the Coastal Bend Women Lawyers Association. Hon. 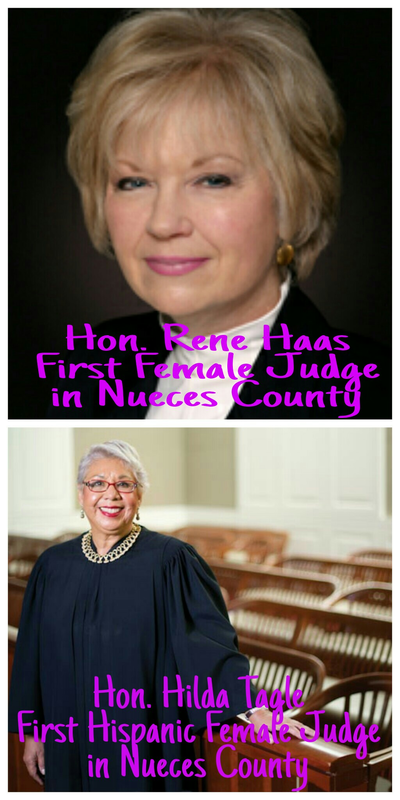 Rene Haas was the first to make history by becoming the first female judge in Nueces County in 1982. A few years later in 1985, Hon. Hilda Tagle became the first Hispanic female judge in Nueces County. Judge Tagle continued breaking barriers by becoming the first Hispanic female federal judge when she was appointed in 1998 to the United States Southern District of Texas, Brownsville division. These women along with Marisela Saldana, Portia Bott, Edna De Los Santos, Ann Kollmorgen, Shirley Selz, and Jeanne Chastain became the organizational founders of a newly formed unincorporated association of female lawyers in the Corpus Christi, Texas area known as the Coastal Bend Women Lawyers Association which officially began on September 1, 1988.